Kyle Sagar is sole trader from Buckinghamshire with over 10 years experience in the industry. Fully qualified Audi Technician NVQ level 2 & 3 City & Guilds, IMI Hybrid awareness certification. 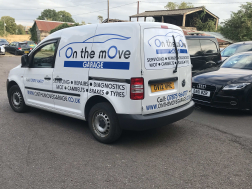 Kyle has an extensive knowledge of all brands of cars and can carry out servicing, repairs and MOT's on a vast range of vehicles. Performance upgrades & re-mapping options are also available. Kyle has also looked after Ginetta race cars in the GRDC+ Championship. He offers race preparation and race support. Kyle is a car enthusiast who's aim is to provide an exceptional service for his customers. Kyle did a brilliant job fitting new brakes on my Citroen. Very pleasant and courteous young man - I’d have no trouble in recommending him or ClickMechanic in the future. Thanks Kyle! Very happy with the work carried out. All went to plan. Arrived on time and despite the wrong parts being delivered still managed to finish the work in a reasonable time. Excellent knowledge, really pleasant guy. Finished the job within an hour. Very impressed.